The Ocean's Ten features indoor/outdoor dining areas where you can sample foods prepared with influences from around the world. The bar area is not only fully stocked with liquors and wines from around the world but with 17 TVs and a GIANT LED Screen for sports fans to enjoy their favorite events from every angle. Dinner time is always ShowTime at Ocean's Ten. 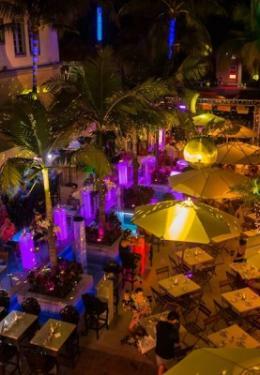 Enjoy a live band every single night followed by the Ocean’s Ten dancers dancing to the beat of our world renowned DJs.